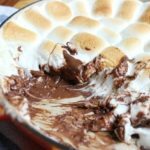 How to make oven baked s’mores dip in a cast iron pan using fluffy marshmallows and melted chocolate, dipped with crispy graham crackers. An easy baked appetizer the whole family will love! Nothing says summer like a good s’more in your hand. 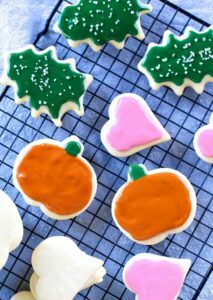 That gooeyness that sticks to every finger, is what makes this dessert such a treat in our home. There’s only one problem. We don’t have a fire pit. It’s something we’ve talked about building in our back yard for a cool summer evening, however I decided that the S’mores could not wait. 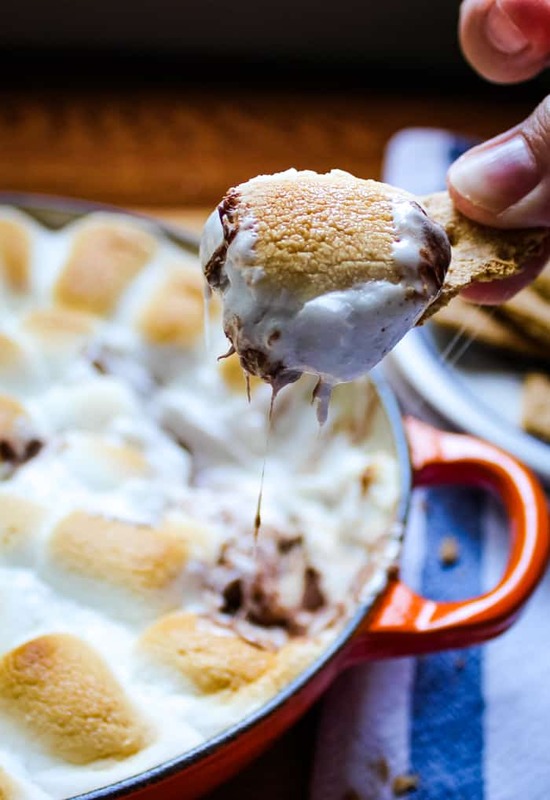 Instead, I made a S’mores dip that tastes exactly like the S’mores you would make over the campfire. 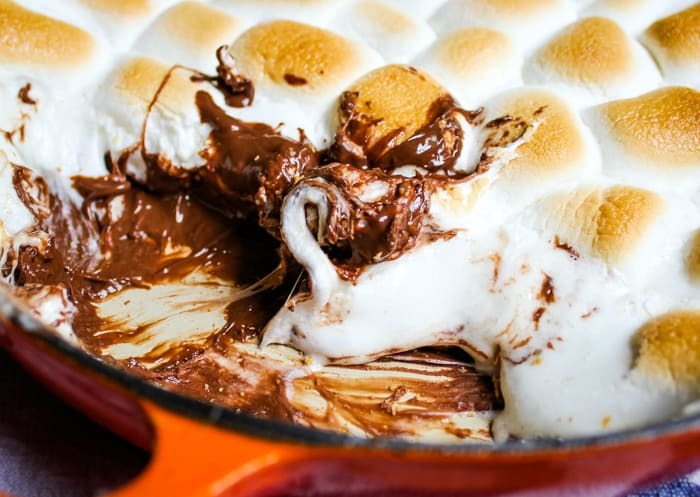 To make the S’mores dip you will need – well, just what you’d need for S’mores. 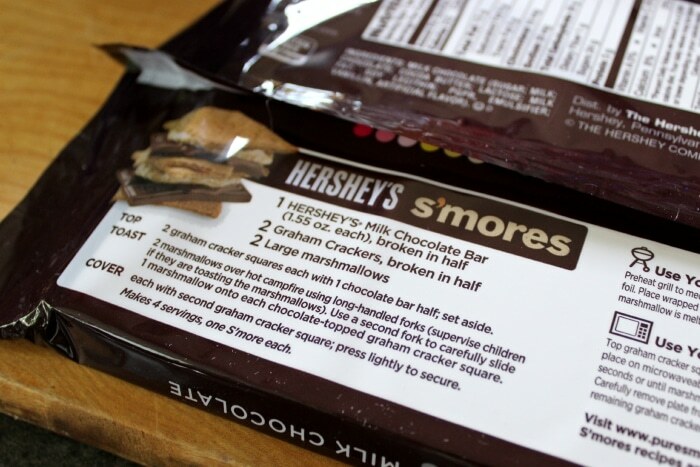 Step 1: Layer the Hershey’s Milk Chocolate on the bottom of a round or square pan that you can place in the oven. A cast iron pan would do great as well. I put about four Hershey’s Milk Chocolate in the pan. 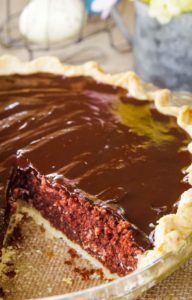 However, if you have a lot of chocolate lovers, you may want to add some more. 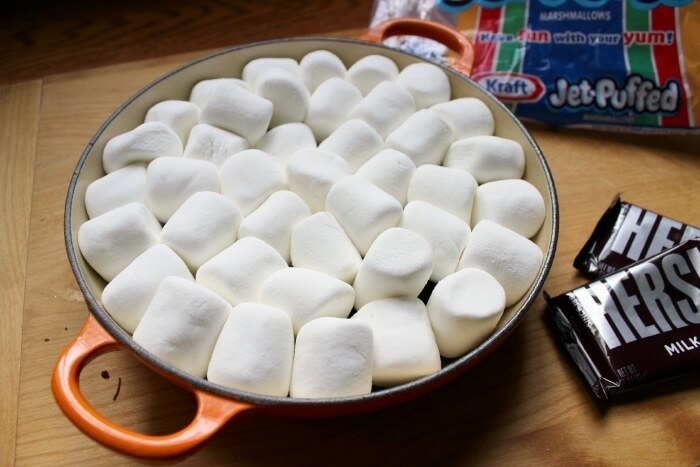 Step 2: Top the chocolate with a full bag of marshmallows. Pack them in there. Step 3: Bake in a 450 degree Fahrenheit for 4 to 5 minutes or until golden brown. Keep a close eye on it. I have to admit, I was almost tempted to burn the marshmallows, as that’s how I love them over the campfire. Anyone else out there who loves a burnt marshmallow on their s’more? 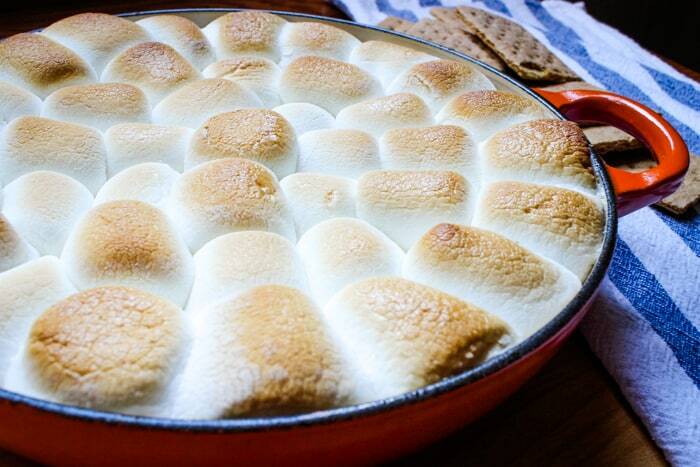 Let the s’mores dip cool for 10 minutes. Dig in and enjoy! The pan serves about six people. And let me tell you, it’s delicious and tastes just like the s’mores you make over the fire – this is just a fun treat when it’s raining. 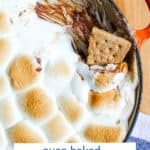 I can’t wait to make this s’mores Dip recipe again. It is addicting! 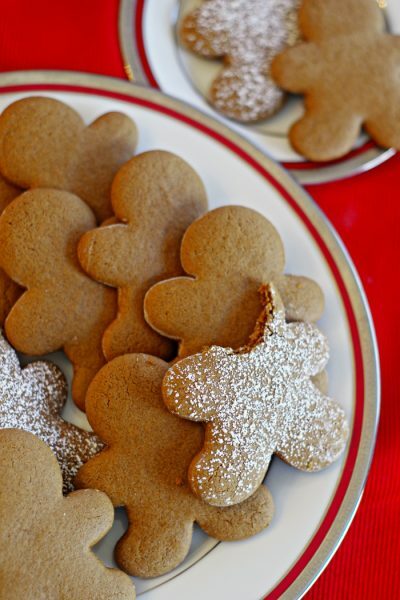 For more information, including crafts and recipes, visit CelebrateWithHersheys.com. 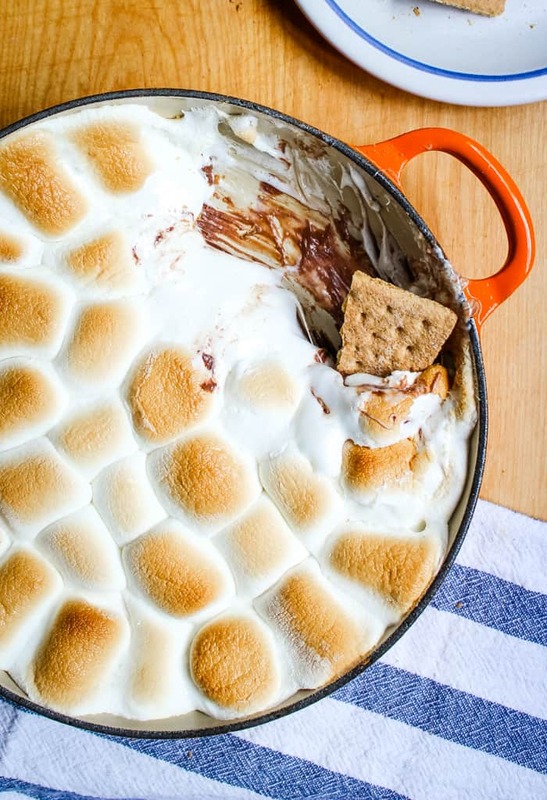 I hope you enjoy this s’mores dip as much as we did. Enjoy! my marshmallow puffed and I thought it would explode in the oven! it came out so sticky. it didn’t burn the top only made if puffy. I think I failed. Ingredient list calls for graham crackers but I do not see them in the directions. 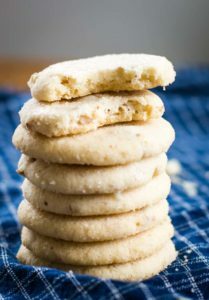 Where do the graham crackers belong and how are they processed to add: crumbled by hand; crushed with rolling pin or blender; or, added whole? 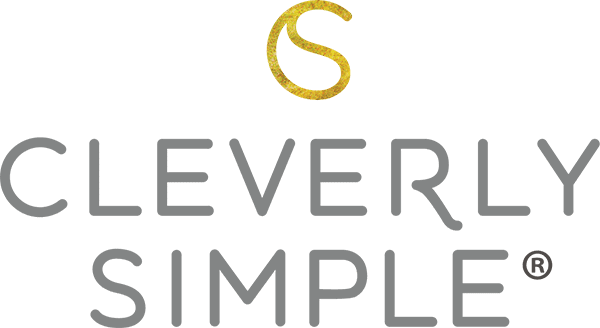 Que receita mais diferente e ao mesmo com aparência deliciosa, amei, vou tentar fazer igual. Hello, I made this, but how do you keep the chocolate smooth and melty? Mine came out with the chocolate a little clumpy. Hello! May i know if is it okay to broil it insted of baking it? 🙂 thank you! 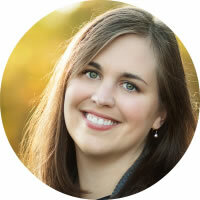 Hi Joanna, You need to bake it. You can broil it add the end to give it an extra bit of crispiness. 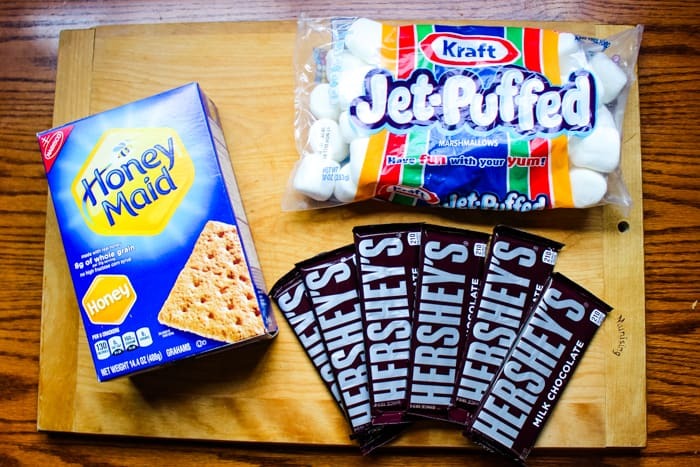 However, if you broil the smores from the beginning it may be too hot to get the chocolate melted before the top burns.